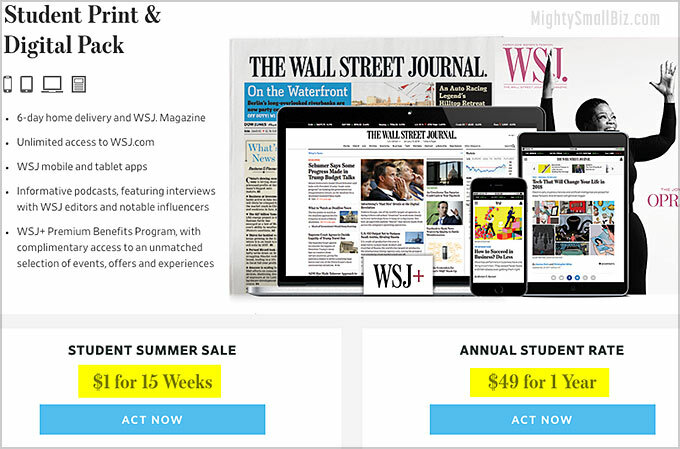 Student discount for the Wall Street Journal: Did you know that as a student you are eligible for a deeply discounted price on a subscription to the Wall Street Journal? 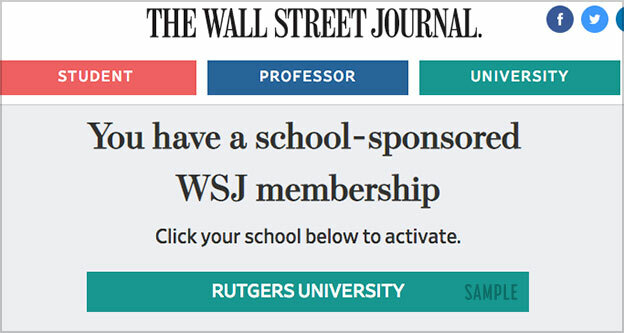 In fact, there is more than one way to get a Wall Street Journal student discount which can come directly from WSJ or sponsored by your school. Here are the best ways to get a Wall Street Journal Student Discount, or even a free subscription. *Did you know that students can get TurboTax for free? Did you say, “free WSJ subscription! ?” Yes, it’s true! 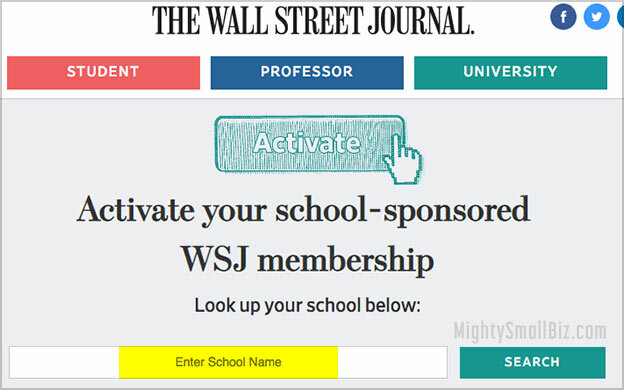 As a teacher or full-time student enrolled at a participating college or university you may be eligible for a free subscription to the Wall Street Journal. Enter in your school or college name, and check to see if you qualify. If you do, you’ll just need to prove that you are a student, often with a school email address or login through your school’s website. As you can imagine, WSJ for students is packed with the same features as a regular subscription. Interested? You can get started here. *Did you know students can get Quickbooks for free or at a discount? #3. Not a Full-Time Student? Get a 50% Discount on the WSJ! Yes even if you don’t qualify as a full-time student currently enrolled in classes, you can still get a 50% discount. How? Well, MightySmallBiz.com is one of a number of small business and finance blogs that are given special discounts to pass on to our readers. The best part is that you don’t even have to be a student of any kind! (Except, a student of life, of course) Anyway, you can get the 50% discount, or check all WSJ deals here. This entry was posted in coupons and tagged college, discount, student, student discount, subscription, wall street journal, wsj on November 12, 2018 by kevin.